Psychoanalysis and Buddhism tell us there is no such thing as wholeness. It is an illusion. We look in the mirror and see our bodies as complete and undivided. And yet in our heads, we don’t feel this unity. We feel deficient, imperfect, always lacking something. The Buddhist-psychoanalyst Mark Epstein tries to teach us how to accept this fractured self. One of his books is called ‘Going to Pieces Without Falling Apart: A Buddhist Perspective on Wholeness’. Wilma Tabacco has, through her art, found her own way of coming to terms with this fragmentation, this sense of things falling apart. Everyone lives with the unsettling gap between the ideal self and the daily self. We try to fill it by buying things, or through our work. We push away feelings of emptiness, we tell ourselves that when we have got this or done that, we will feel better. Often, it takes a major trauma which shatters our preconceptions of ourselves and our position in the world to force us to confront this reality. When Wilma, slipped and fell on the shiny marble floor of an airport, her world turned to shards along with her kneecap. As a friend, I watched Wilma go through a dark time. At first she assumed that the bone would knit itself perfectly back together and that the pain would subside. After a period of convalescence her life would go back to normal. Her leg would function as it once had. This is how the story is supposed to go. But time didn’t heal in the way that she, or any of us, had expected. Her recovery was halting, one step forward, many steps back. All those simple actions – walking, running, even standing – could no longer be taken for granted. Painting is a very physical business. Wilma’s large canvases had always demanded long periods of standing, stretching, twisting and kneeling. How was she to continue throwing her whole body, her ‘whole’ self into her work? Art has a peculiar way of anticipating life. In some respects, this makes sense. Our unconscious – the well-springs of art - is the repository of repressed material that has not surfaced in our conscious lives. For many years Wilma has been focused primarily on the possibilities of the stripe with its long history and complex history as both a form of transgression and a means of creating order. Drawing on this tension between mayhem and stability, she has made the stripe leap and shimmer; she has made it jitter and hum. She has slanted it and bent it; she has used it to set off dazzling waves of motion. Her stripes intersect in ways that hint at three dimensions only to slam the flat, impenetrable surface of the canvas in the viewer’s face. Optical illusions often fail to deliver the comforting illusion they promise. To look at her striped work is to be thrown off balance, to be left feeling unsteady and destabilized. By the time of her 2004 exhibition Slipstream, she had already introduced a ‘seismic shiver’, a fault-line that splinters the stripe and creates jagged shapes within. In refracting and breaking-up the stripe, her art instinctively challenges the illusion of wholeness and sense of order to which we all cling. And then strangely and shockingly, life seemed to take its lead from her art. Everything was thrown up in the air as her knee came crashing down on that hard cold floor. During this dark time her work did not make a sudden or radical ‘break’ – as you might expect - from what she had been doing before. The spatial confusion and disorientation she was now experiencing were already a theme in her work. For some years, she had been deconstructing the stripe, or to put it slightly differently, she had been turning her attention to the ‘negative’ spaces created by them. Now, more than ever, it made sense to explore the shard, the fragment - that symbol of the fractured self – but without nostalgia for wholeness or hankering for what had been. Instead of presenting shards as pieces of a jigsaw that can be put back together again, or as letters that can be reassembled to form the original words, these new works, collectively titled Flights of Fantasy, revel in the exhilarating uncertainty of tossing things into the air to see where they fall. The random patterns that life throws up. For all the unease that Wilma now inevitably associates with being airborne, the exhibition’s title defiantly celebrates all aspects of flight, even as the works acknowledge the darker, vertiginous side of the experience. This double sensation is apparent in a painting like ‘Cascade’ where the jagged aubergine shapes might be perceived as floating gently to earth or eternally suspended mid-air. Or, they might be pieces of shrapnel sent sky-high by an explosive force. As Wilma acknowledges, the title Flights of Fantasy is also ‘a sort of ironic self-mockery and a method of self-preservation’ because she isn’t yet willing to travel. ‘Naturally flying is associated with airports, so, once again, I’m having my own private joke. So what if I can’t physically travel? I can do it in equally valid and certainly more liberating ways. I can invent my own spaces and places.’ Not surprisingly, she has developed a fascination with maps which conjure up these invented places. Yet while maps promise to guide us to where we want to go, Wilma’s map-inspired works on paper are more like a maze. They invite the viewer to accept being lost, or of not going anywhere in particular. Of living without a clear sense of direction or destination. This disorientating, bewildering effect is also characteristic of the paintings in which the stripe has morphed into paths that lead nowhere, into cul-de-sacs. ‘Flights of Fantasy’ with its broken, criss-crossing deep purple lines and agitated mood, leads the viewer into a bewildering space that cannot be navigated except by chance. And yet, as if in answer to this disturbing illogic, ‘Sky Dive (Umbria)’, with its aerial perspective of luminous paths traversing fields of blue and violet, emanates a Zen-like air of calm and acceptance that there might be no way out of the maze. Out of this period of forced immobility, Wilma has also found a new material and a new technique. Working with gold leaf has demanded enormous patience. ‘It’s a very slow, almost meditative process which requires you to be restrained and calm.’ Because of the fragility of the leaf, she has had to accept that accidents will occur. ‘A slight breeze, one’s own breath or a trembling hand can cause the translucent leaves to become airborne, float and collapse.’ She recognises that good things can come from these accidents – a telling observation given that ‘accident’ is, for her, such a loaded term. One serendipitous accident was the blue shadowing around the gold leaf shards of ‘Airborne’ that resulted from sanding the clay base on which the gold rests. Not surprisingly, blue and its many shades - manganese, cerulean, turquoise, indigo, Prussian blue, French Ultramarine, cobalt, old Delft blue, sapphire, permanent blue – dominate these works and generate a fittingly melancholy yet healing mood. 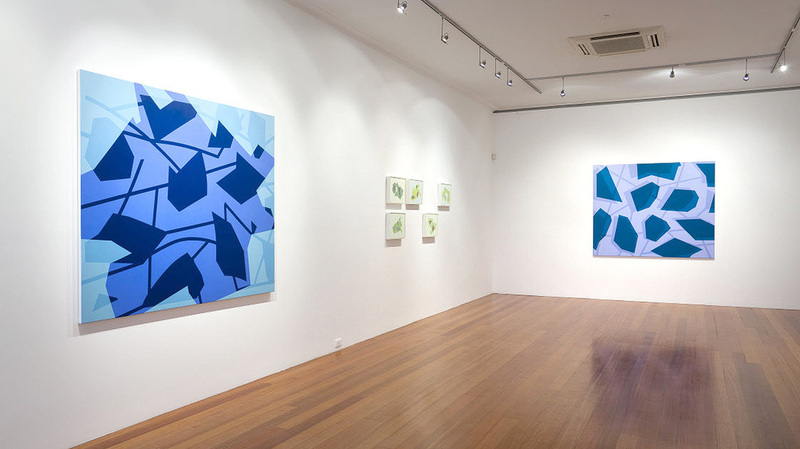 And just as the Blues in music give voice to personal tribulation – love gone wrong, cruel twists of fate – so too does this ‘blue period’ tell of pain and transformation through art. Fiona Capp is the author of three novels and two works of non-fiction. Her latest book is the novel ‘Musk & Byrne’ published by Allen & Unwin. Whether on foot or in a vehicle, (with or without the aid of a map or electronic equivalent) navigating through urban spaces means to be aware of concreteness and openness. This ought to be straight forward enough. However the fracturing and refractive events that occur in urban spaces packed with hundreds of office, residential and retail towers glistening with glass, polished metals and high-gloss paint surfaces can, for a pedestrian at least, generate physical spatial unease. Such spatial disorientation can just as easily be experienced in parts of Melbourne, London, Beijing, Hong Kong or any other metropolis undergoing architectural renewal. Contemporary centers provide ample opportunities for reflecting on the nature of the reflected image. Perceiving something through something else, in an almost infinite regress and as a distorted mirror image, can be an unnerving experience that acts to highlight the illogic of trying to locate oneself within a fixed time and space. It can also be an enjoyably narcissistic act that permits us to glimpse our own personal reflection and locate it within histories and geographies established in the past but embedded in the present moment. Regardless, disorientation stimulates the act of looking and vice versa. 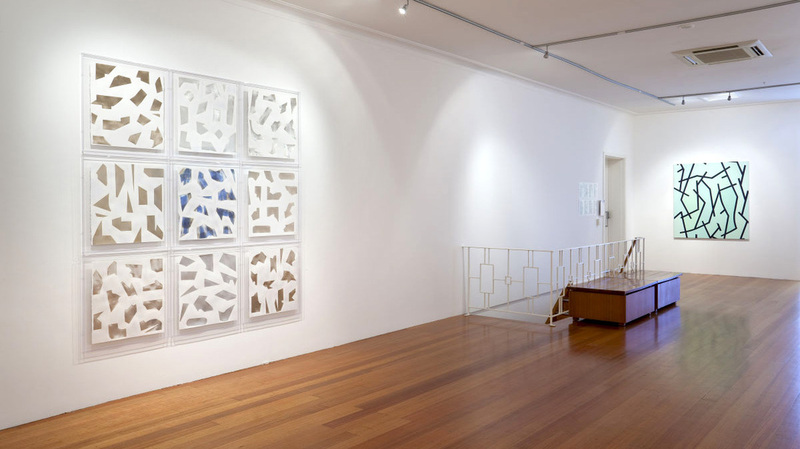 Airborne is a text generated series of nine works on paper constructed using the cutout letters of the written alphabet that spell the words ‘London, Melbourne’. Words are decipherable abstract linguistic codes denoting the known, the imaginative or the speculative. In this case they have been rendered unreadable and unrecognizable as alphabet by being cut into fragments. The resulting shard like abstract shapes have been rendered in gold and rearranged (5 panels use the Melbourne shapes, 4 the London) to create map-like images that recall city blocks or buildings and road or rail networks. Alternatively, the shattering of form and space may have more dire implications. The use of gold, both 23.75 moongold and 12 carat white gold, in the centuries-old technique of gilding, reflects my preoccupation with the handmade. This process, the results of which are best exemplified in illuminated manuscripts, is tedious, laborious and unforgiving. A slight breeze, ones own breath or a trembling hand can cause the fragile translucent leaves to become airborne, float and collapse. I have chosen gold for its capacity to suggest an ever-changing environment. The gold leaf surface in these works dissolves the structures of the space that houses them and can return, in their stead, shimmering light and distorted reflections of everything around and within it: a mirroring perhaps of a confusing but bedazzling and pleasurable place to be. Like any jig-saw puzzle the forms in these compositions could, theoretically, be reassembled to reconstruct the original alphabet and words. This of course would require the destruction of the work itself.